Sandwich Opera House presents the Foggy Mem’ry Boys, which features some of the best musicians in the Fox Valley region of Northern Illinois. 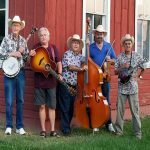 They love to perform live and have pleased many audiences with hard chargin’ fiddle tunes, traditional bluegrass and popular country standards. Go to sandwichoperahouse.org for ticket pricing and upcoming events.